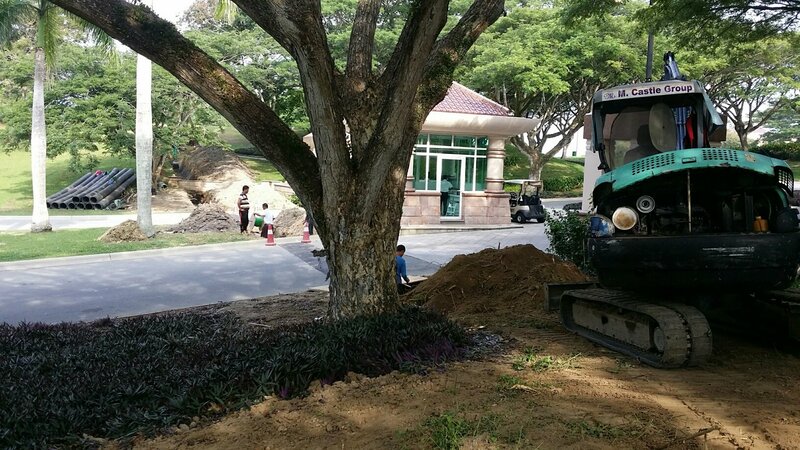 Empire Hotel & Country Club in Brunei completed the full upgrade of their irrigation system earlier this year. The Empire is known as one of the most stunning hotels in Asia if not the world with its stunning location, architecture and service. The Jack Nicklaus designed golf course is equally as magnificent as the hotel. Jon Scott, President of Nicklaus Design Agronomy Services at the time, recommended Aqua Turf International, Inc. (ATI) to Empire to provide irrigation consulting and design services. Soon after the introduction ATI got busy working with management to design an irrigation system to meet their needs. Located near the ocean and with some significant elevation change the irrigation challenges were great. Also, Empire is a bit unique in that much of their play comes in the evenings under the lights so the players can avoid the sun and heat. Unfortunately, there was no automation to the lights so often the lights would be left on much longer than needed. This would waste power and decrease the life of the expensive bulbs which are also difficult to replace. Staff time was also required for their manual operation. James Schumacher, President of ATI and lead designer on the project, had previously designed and installed irrigation systems capable of controlling ball field lights in Huntsville, Alabama, USA before. Now was the perfect time to not only design an efficient irrigation system in terms of water use but to use that experience to also design a system to save power and labor required for the lights. James Gordon, golf course superintendent, was highly involved in every step of the design and installation. As a Country Club and Five-Star Hotel the expectations of the clientele are high. James was instrumental in seeing that all the details were attended to and performed in the hotels and members best interests. During the pre-design planning of the irrigation system a decoder style control system was selected for various reasons. The decoder style system complicated the design somewhat compared to a conventional satellite system. ATI worked closely with Toro to insure the proper control relays, decoders, wiring and other switching materials required were designed and installed correctly. To our knowledge this is the first of its kind. With over 190 individually controlled light poles on the course the lighting greatly increased the size of the control system which had to be taken into consideration. Now the lights can be operated fully automatically saving time and expensive power costs. Limited Disruption of Play While Cutting the Sod, Installing the Pipe and Wire, Compacting Soil and Then Replacing the Sod. The pipe and fittings were high quality HDPE with Leemco Ductile iron valves all supplied by CMF Global from the USA. Toro Infinity sprinklers featuring SMART ACCESS were selected so the decoders could be easily serviced without digging. A weather station was installed to assist the superintendent in monitoring the weather and adjusting the daily ET and run times. Not surprisingly monkeys can be seen everywhere on the course. In this case the cage was used to keep the monkeys out and not in! A new state of the art INTA fertigation system was installed into the existing FLOWTRONEX pump station. Fortunately, the pump station had been replaced just a few years earlier and was of adequate capacity. ATI provided site inspection and programming services to insure the system was laid out, installed and programmed to the specifications. The improved irrigation on the greens provides much more uniform coverage of the water than before. The central control system with individual sprinkler control gives James the tools to dial in the water so the course can be kept much drier than ever before. The playability of the course has greatly improved not to mention the quality of the turf as seen in the photos below. Also no time is wasted on continual repairs and the members and guests aren’t burdened with irrigation repair holes dug up all over the course. The investment in the irrigation system combined with the professional management provided by James and his staff has paid off in improved course conditions, increased play, lower operating costs and improved customer satisfaction. If you are considering a renovation don’t forget your lighting needs too which can help justify the renovation even more! Contact Aqua Turf International if you are interested in an irrigation renovation so you can turn out the lights on your waste too!